Newton's history begins in 1870 with the arrival of Judge R.W.P Muse, a railroad agent representing the Atchison, Topeka & Santa Fe, who was investigating possibilities for extending the railroad. 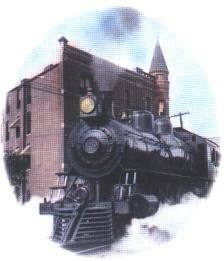 Located on the Chisholm Trail, Newton seemed a very logical location for a Santa Fe terminal. By 1871, the new town had been named by a group of Santa Fe stockholders after their hometown, Newton, Massachusetts. With the completion of the railroad line in 1871, along with stockyards and loading chutes, came a shift in the cattle trade from Abilene to Newton. Newton became the West's newest cowtown and soon became known as "Bloody and lawless - the wickedest city in the west" enjoying the cowboy reign from June 1871 to January 1873. Completion of the Santa Fe to Dodge City and a branch to Wichita drew the cowboys to these places, ushering in more peaceful and prosperous times. In 1874 Mennonites came to Newton, bringing Turkey Red hard winter wheat to the area on a large scale. Mennonite immigrant Bernhard Warkentin was instrumental in the development of Newton. Warkentin's efforts with hard winter wheat made Kansas known as the "breadbasket of the world."